"The big oil companies are the most profitable on the planet. But Scott Brown voted to give them $20 billion in taxpayer subsidies," says the narrator in the ad. "Big Oil gave Scott Brown thousands of dollars within days of his votes. Now Big Oil is spending millions to get him back to Washington." The commercial also includes short interviews with New Hampshire residents who are critical of Brown. "Scott Brown is in it for Scott Brown. Nobody else. Not New Hampshire. No way," says one man, at the end of the ad. The Shaheen campaign tells CNN that the spot ran statewide for at least a week on WMUR and WBIN, New Hampshire's two main broadcast stations, as well as on cable television. 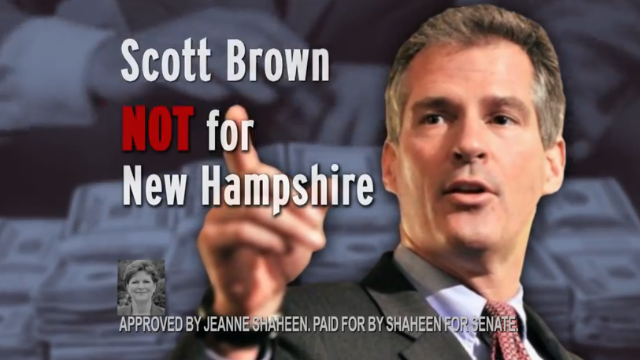 Ever since Brown formally declared his candidacy back in April, the Shaheen campaign repeatedly characterized him as being tainted by money from the big oil interests, but this is the first time they've broadcast that message on a paid TV ad. The spot's release comes as the New Hampshire Democratic Party launched "Big Oil Billionaires for Brown," a campaign they say will include earned, paid, and owned media initiatives. The commercial's release comes one day after the Brown campaign went up with a spot statewide on TV that highlights support from the state's other U.S. senator, Republican Kelly Ayotte. "I support Scott Brown because I know that he's for fiscal responsibility, accountable government, and finally a health care plan that works for all of us. He will give everything he's got for New Hampshire," said Ayotte, in the commercial. The race has also seen lots of spending by outside groups on both sides of the aisle. And Tuesday two of those groups, who are supporting Brown, took to the airwaves with new ads. A WMUR/Granite State poll released last week indicated Shaheen held a slight two-percentage point margin over Brown in a general election showdown, which is within the poll's sampling error. Surveys earlier this summer showed Shaheen with leads between 8 and 12 points. The New Hampshire GOP says the new Shaheen ad is a reaction to what appears to be a tightening of the race. "Jeanne Shaheen’s dishonest ad is the latest sign that the senator is in a full blown panic after polls have confirmed that voters are souring on her record of voting with Barack Obama 99 percent of the time. Shaheen is a desperate Washington politician who has insulted her constituents by refusing to hold traditional town hall meetings, and Granite Staters are ready to replace her with a responsible Republican senator who will put New Hampshire first," said Jennifer Horn, chair of the Republican State Committee. "Jeanne Shaheen and her allies are doing everything they can to stop Scott Brown in the primary. Their negative attacks won't work because voters can see for themselves there are real differences in this race – on jobs and the economy, on immigration and on foreign policy," said Brown campaign spokeswoman Elizabeth Guyton. "In California, Governor Brown took a $20 billion deficit and now we're basking in record surpluses." The truth of that statement is debateable. But even if true, it simply means the government took TOO MUCH money away from the citizens, and therefore took it out of the economy. "Basking in record surplus" is nothing to be proud of... why can't the government just budget properly so that there is neither surplus nor deficit? You know... like a balanced budget amendment?